It is common to assume that someone had a formal burial, but this is not always the case. Immigrants who died at sea were likely buried at sea. This does not mean that there is no record of the burial but obviously, there is no gravesite. People do and did wander off and die or die while crossing the plains or any number of ways where the body was never recovered. In all these cases, there may or may not be a record of the death and/or burial. It is not a good idea to focus on records for a single event in an ancestor's or relative's life. If a person was born more than 110 years ago, you can presume that they are dead. But remember the opposite is also true, do not assume that someone is dead if less than 110 years have past since their birth. You may want to kill off your relatives, but it is not a good idea to publish their deaths online before they actually die. As I have already mentioned, in this day and age, it is a very good idea to do an exhaustive search online for information about a burial before traveling to a remote location and searching around for cemeteries. Many early burials, especially in the rural parts of the United States and some other countries, were done in private, family plots located right on the property where the family lived. In these cases, early maps, diaries or letters may contain a clue as to the location of the private cemetery. Once the general location has been established, it may be possible through land records to determine the location of the cemetery. I have run across cemeteries in some of the most unlikely places. Once when hiking in the mountains of central Arizona, we found an old abandoned cemetery near an old mine. Locating the possible burial location is only the first part of the project of finding the grave. It is fairly common that people were buried in unmarked graves. The grave may only have been marked with a wooden cross or other temporary marker or the marker, even made of stone, may have disappeared over time. The marker shown above in the image is for my great-great-great-grandfather, William Linton, his wife and daughter, but he was originally buried in another cemetery. I found this out when I examined the burial records for the Westminster Cemetery outside of Philadelphia, Pennsylvania and learned that he had been buried there many years after he died. The precipitated a search for the original burial location which was determined to be the Fourth Presbyterian Cemetery in downtown Philadelphia. That cemetery had been destroyed (or moved) by construction of new buildings and his body was moved. This is a good place to illustrate the possible complexity of the burial situation and the records that can be generated by quoting myself from some early writing. Here is a hypothetical situation as it may occur with some rewriting from my original publication. Let's suppose that a person named John Doe died within the past 100 years in the United States. He was a resident of Arizona but died in New Mexico. Since this is a hypothetical situation, I can make it as complicated as I wish. He was in an accident and died in a hospital so there are hospital records of his injuries. There is likely a newspaper report of the accident and his subsequent death. There may also be police records of the investigation of the accident. When he died, an attending physician may have been present or may have been called. If there was no physician or doctor available, the body may have been attended by an mortician or an employee of a funeral parlor. A physician or mortician is the one who may have signed a death certificate with the state, if that was required at the time that John Doe died. A local mortuary may have been called to come and remove the body so there would be mortuary records. This is not always the case since the body may have been viewed in a private residence and then privately buried. In my example John Doe's family is in Arizona and they want him buried in Arizona. So they have to make arrangements with a local Arizona mortuary to receive the body and with the mortuary in New Mexico to transport the body. This creates more mortuary records. The family then, depending on the location and time period involved, has to obtain, through the mortuary, a permission from the government to transport the body. The body then is sent by train to Arizona where it is received by the local mortuary. More records are generated by the railway such as shipping records. The family has to make arrangements in Arizona to purchase a burial plot. The mortuary could be involved in that process or the family may have gone directly to the cemetery with the body. There may be a contract for the sale of the cemetery plot and a deed for the plot. The mortuary then prepares the body for burial and could have sold the family a coffin. There may be documents regarding the sale of the coffin. If the family wanted to have a funeral and/or a graveside service, there would be also be documents such as a funeral program or graveside service program that are printed for those who attend the funeral or memorial service. The family may order some flowers so there may be a contract for purchasing the flowers or a receipt. The mortuary usually provides a guest book (included in the price of the funeral) and so that guest book may be available. The family also wants to notify people of the funeral so either the family or the mortuary or the newspaper (or all three) writes an obituary or death notice. Before the funeral is held, the mortuary has to obtain both a Permit for Burial and a permit to open the grave from the county or state. After the funeral, the body is transported to the cemetery and buried. There is then a permit issued to close the grave. Once the body is buried, there may also be a contract to maintain the cemetery plot. The family may wish to mark the grave and may have a contract for the creation of a headstone or tombstone. The cemetery makes a record of which graves have been created and which ones have headstones or not. In some cultures and religions, memorial services may be held for the deceased a year after the death. Sometimes a memorial is printed in a local newspaper a year or more after the death. At some point, the state or county will make an index of all their burials. Obviously, not all those steps and forms will apply to any one burial, but this example should suggest that looking for burial records can be challenging. You might realize that if any one or more of these documents survive someplace, then they could all be useful in establishing the location of the burial and perhaps the facts surrounding the death. Another issue that must be resolved before attempting to visit a burial location is whether or not the the location is on public or private land. You should always take the time to investigate any limitations on access. The physical location of the burial may be be difficult to find or access, as in my example of the cemetery located near a mine in the mountains of central Arizona or the example I mentioned previously of my sixth great-grandfather buried in a cemetery located in Rhode Island. What I did not mention previously was that the Rhode Island cemetery was located in the middle of a huge blackberry bramble patch and almost impossible to approach without injury. In the United States, many cemeteries, even private ones, were marked on government topographical maps. 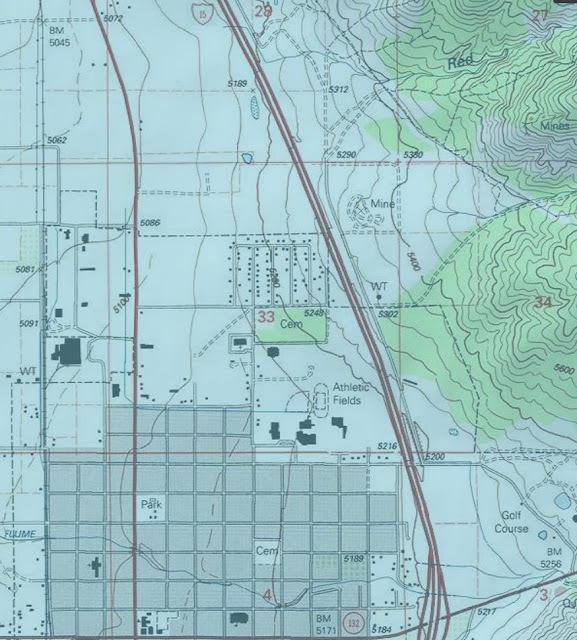 The United States Geological Survey (USGS) has a huge collection of more than 170,000 government created topographical maps in their Historical Topographical Maps Collection online. There is also an online publication of all of the Topographical Map Symbols. Careful study of these maps may show the location of long forgotten and abandoned cemeteries. Here is an example of the symbols used on the maps including the one for cemeteries. Here is a portion of a topographical map of the town of Nephi, Utah and the Vine Bluff Cemetery from the USGS TopoView website. 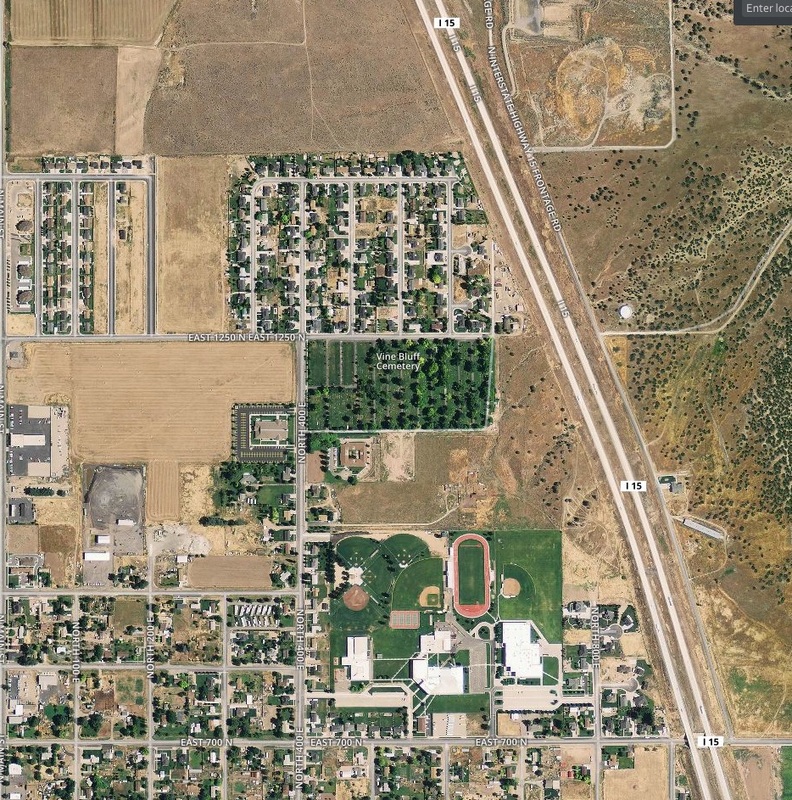 Here is a satellite view of the same area. It helps to have the exact geographic coordinates (latitude and longitude) of the cemetery in order to find it once you are on the ground driving or walking around. If you have the geographic coordinates, you can also easily see a satellite view either with Google Maps or the free downloadable program, Google Earth. 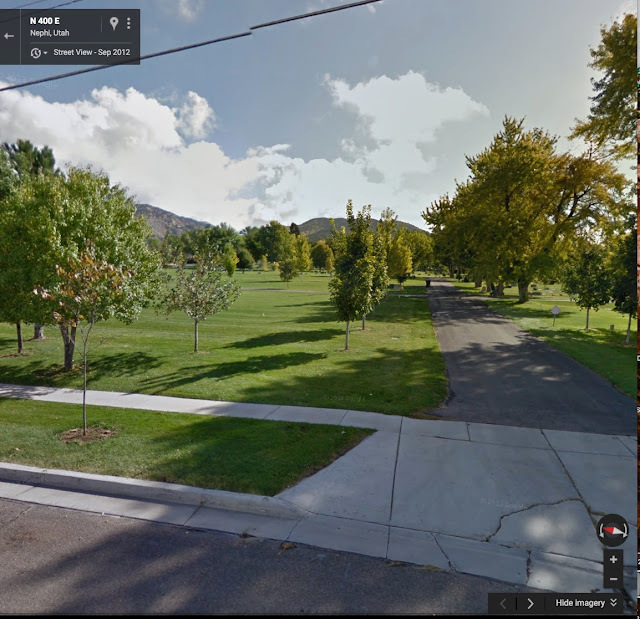 With either of the Google mapping programs, you can also zoom in to street view and see the cemetery location if it is near a road. Here is a Google street view image of the Vine Bluff Cemetery entrance on Nephi, Utah. Despite all of these high-tech ways to explore a cemetery, it is still an important part of genealogical research to make the visit yourself, if possible. This is a series. Here is the previous installment.